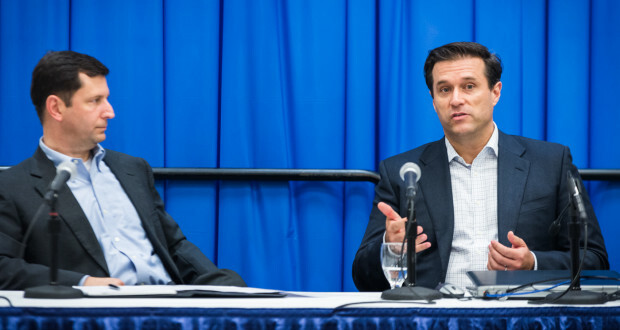 AETI President and CEO Charles Dauber (left) and FlexGen Power Systems’ CEO Josh Prueher (right) announced a partnership to equip drilling rigs with FlexGen’s Solid State Generator at OTC 2015. The SSG can reduce emissions, fuel consumption and maintenance costs. Under the partnership, M&I will sell, deploy and service the FlexGen SSG into key energy markets, including the United States, Canada, Mexico, Asia, South America and the Middle East. As part of the strategic alliance, the companies will partner to build a fully integrated FlexGen SSG into a drive house. By integrating the FlexGen SSG, drilling contractors and operators will see lower capital costs, faster drilling speeds, along with greater reliability and efficiency. “The FlexGen Solid State Generator is a game-changer for the oil and gas industry. By increasing power performance and reliability while also reducing fuel costs, maintenance and emissions, the FlexGen Solid State Generator is a product every driller and operator needs on their drilling site,” Charles Dauber, AETI President and CEO, said.